The survey from the 26.04.2014 to the 03.05.2014 was carried out with two tachymeters and a notebook with AutoCAD, TachyCAD and Photoplan software. The contors of the outside wall and any structures in its imidiate vicinity were measured along their inner and outer edges as three-dimensional polylines (PDF). The entire facade was documented in 100 survey photographs which must now be equalized and digitalized (Bild). 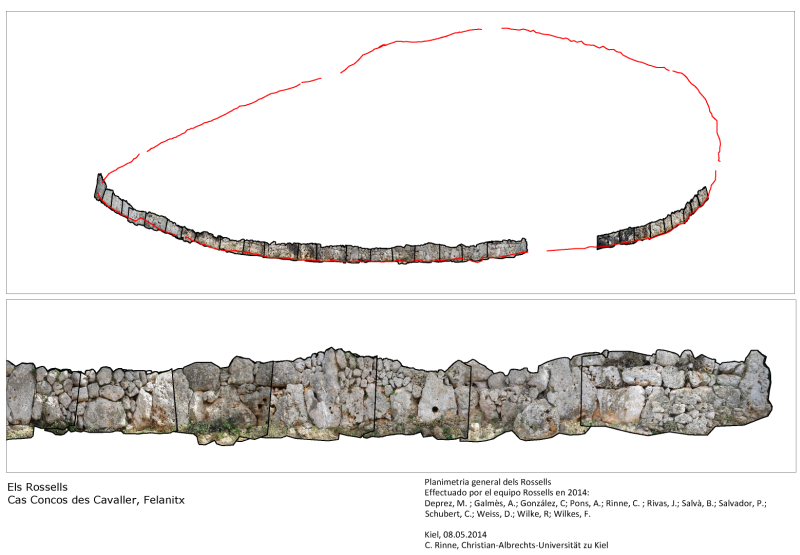 The results of this survey are the first three-dimensional documentation of the wall and a full documentation of the facade including the individual stones. Due to the new data it is now possible e.g. to view the run of the wall on the site, to approximate the heaped soil on the exterior of the enclosure or even to assess the thickness of the collapsed wall segements on the inside which could belong to the still standing construction. The photogrammetry conducted on the facade allows for a detailed description of the constructive differences of individual wall segements (already observed on site) and the quantification and statistical analysis of the used stone sizes. First results show that the wall is 307 m long, on average 3 m thick and is still standing up to 2,5 m tall. The entire constructed area spans 6,640 m² with the interior spanning 5,500 m². The clearence and survey exposed a previously unknown entrance, details on a talayot tower (which was used as a lime kiln in recent history ) as well as further wall structures in an adjacent area. The joint project of the Universitat de les Illes Balears and the Christian-Albrechts-Universität in Kiel was carried out by the two lecturers with three students from Kiel and 42 students from Palma (33 of which only attended the survey half-time) with specific assignments in preparation and execution. The endeavor was aided by the (Amics dels Closos), the significant Bronze Age site of the region Els Closos de Can Gaià and Ca’s Concos des Cavaller for the provision of accommodation and provisions for the german students as well as the parish Felanitx for the hardworking employees of the „Grünamt“ for the targeted removal of the abundant vegetation. The digitalisation of the 100 equalized survey photos were digitalised which made it possible to determine the size and location of every individual stone. The outside measurements of the 3,173 stones can be used for statistical analysis. By visualising the results in a box-plot the very different sizes of stones in various wall segments becomes apparent. The graph confirms, what was apparent in the field that the southern wall stands out in its monumentality compared to other wall segments, making it the representative and imposing facade of the settlement.